A week of Valentine’s Treats ~ Day THREE! 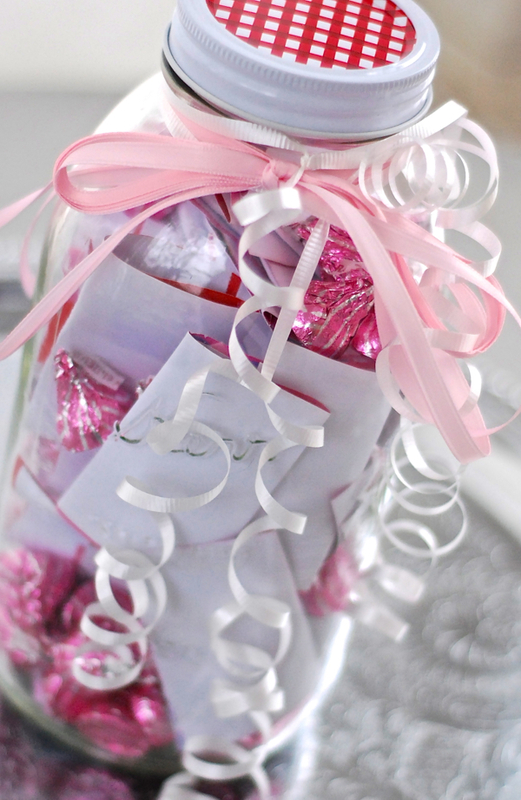 ~ A LOVE NOTES JAR! Today I made a jar of love notes for the hubby. I included coupons for hugs, kisses, back rubs, batches of cupcakes, movie dates, tea dates, lunch dates, candlelight dinners, morning walks, theater tickets, sunset viewings on the porch (with vino) and one romantic B&B weekend. I also included funny memories from the time we’ve been together, love quotes, and things that I love and appreciate about my guy. I sprinkled Raspberry Hershey’s “Hugs” in with the love notes, and I told Jeff that I’d replenish the chocolates a few times. He can pick a note from the jar once a week. This is a fun, romantic way to stay connected, and it’s and easy little idea for Velantine’s! Be creative with your coupons and include whatever type of candy your sweetie likes. Super adorable…totally up my alley 😉 Thanks. SO happy you like the idea, Nicole! yay! 🙂 enjoy, and Happy Valentines! Melissa, I love this <3 TY for posting it!